Yeah, so you've seen the 2014 Corvette because we were the first to show you the C7 in all its uncovered glory. 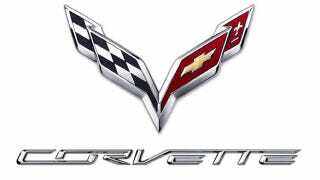 Now Corvette is confirming the obvious, releasing this image of the new crossed-flag badge and letting us know it'll debut on January 13, 2013 as part of the Detroit Auto Show. As a Jalopnik reader you know exactly what to expect. You've seen our drawings, leaked renders, 3D images, and even an animation. Despite all the evidence there are still a few doubters, so we can't wait until they reveal the base C7 'Vette. It may be a bit longer until you see the ZR1 we showed you, but the overall car will be similar.